Purchase Our Entire Set of Gift Puzzle Brain Teasers that Turn Gift Cards, Cash,Wine,and Other Presents into a Code Cracking Game and White Elephant Wine Exchange Party. Use them as Escape Room Puzzles and Props for Your Escape Room Party Event. Includes Puzzle Pod Junior, Puzzle Pod Cryptex Brain Teaser Puzzle and Coin Bank, Vino Vault Wine Cryptex, and Spin the Bottle Wine Game. Design Challenging Code Cracking Games for Delivering Your Gifts with Personalized Clues you Create. Turn an Ordinary Gift into an Adventure. Fun for All Ages on Special Occasions, Hanukkah, Christmas, Birthdays, and More. Puzzle Pod Junior – secret code gift card puzzle box. Recipient must solve your clues to a three letter code word you’ve set in order to open the drawer and get a gift card or cash inside. A fun money puzzle to make someone work just a bit to get their reward. Code is applied by labels and is not resettable. Great for kids, teens, adults and those that enjoy money maze puzzles and puzzle box. Puzzle Pod Cryptex – Can accept any number of gift items, either visible or concealed, within its clear plastic jar. The five letter code can be reset, so it can be re-gifted or used for different escape room puzzle challenges. Makes a unique birthday or holiday gift. With a slot on the bottom side, it can also be used as a coin bank. Vino Vault Wine Puzzle – transforms an ordinary gift exchange of wine into an intellectually challenging game. Taunt them with your fine wine where they’ll have to solve your clues and crack your code before they can crack open their bottle and drink the reward. Five letter code can be reset. 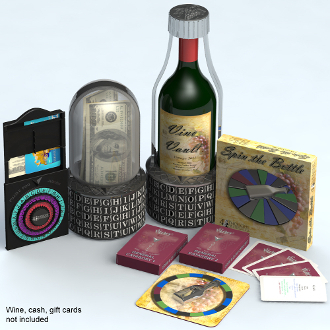 Spin the Bottle –game set extends the use of Vino Vault for its use as a wine exchange party game. Bottles of wine can be won, lost, captured in this drinking game while you taste wine and paired food in this trivia game. Intended for persons 21 and older. Set up on all is simple. They are produced in durable impact resistant grades of plastic that do not break easily. This set of brain teaser puzzles and adult puzzles can provide fun and entertainment for all ages and interests. Set up your own customized code cracking, detective or escape room party and get your gift and game on!